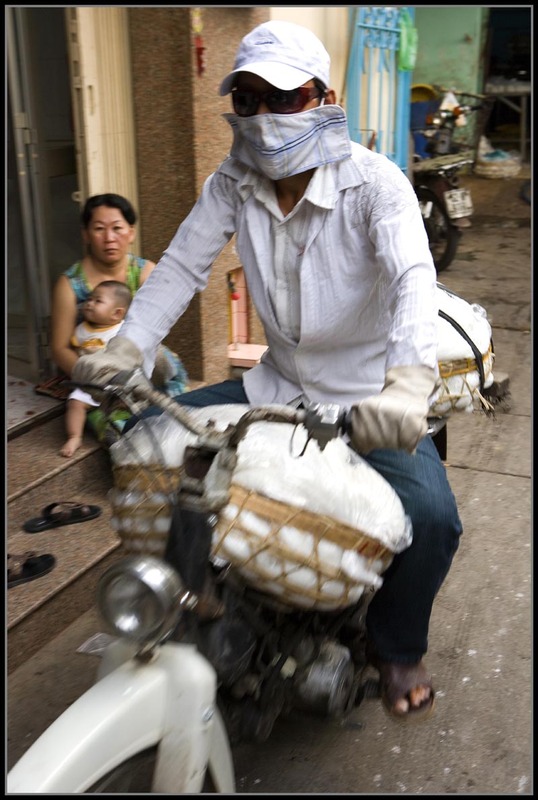 In Vietnam, sometimes things work, and very often they don't. We already knew this fact, of course, after two-plus years living in Saigon, but were reminded of it once again during our trip there last November. 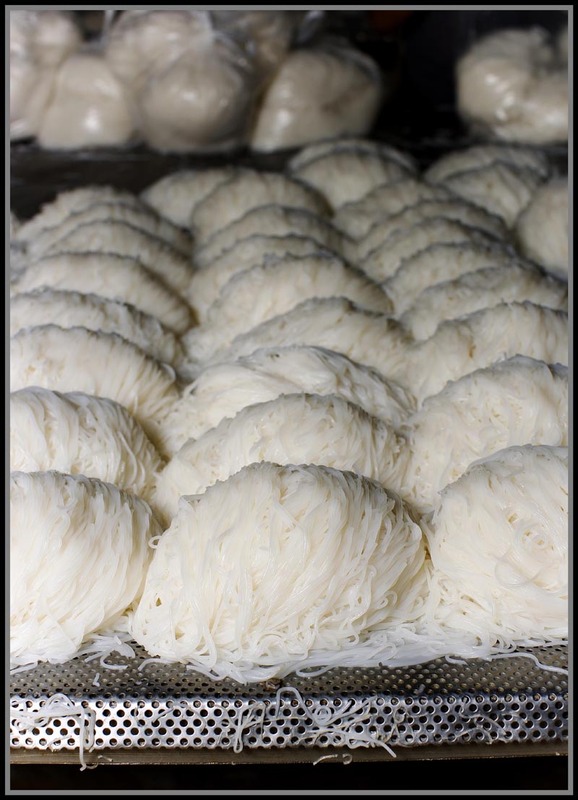 We'd asked our very resourceful friend M if she might be able to help us get access to a bun (rice flour vermicelli) workshop so that we could document how this staple is made. Via a friend of a friend of a family member M came up with an introduction to the owner of a small, twenty-year-old bun factory outside the center of town. 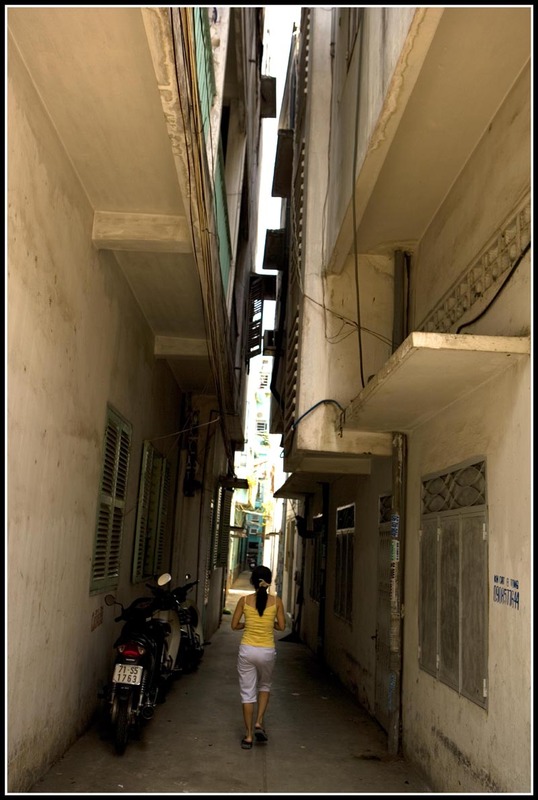 So one afternoon we caught a cab and, after enduring some nasty traffic, alighted and headed down one of Saigon's ubiquitous, anonymous alleys. After a few rights and lefts and a couple more rights we ended up at a cavernous two-room facility thick with humidity and the smell of yeasty fermentation. 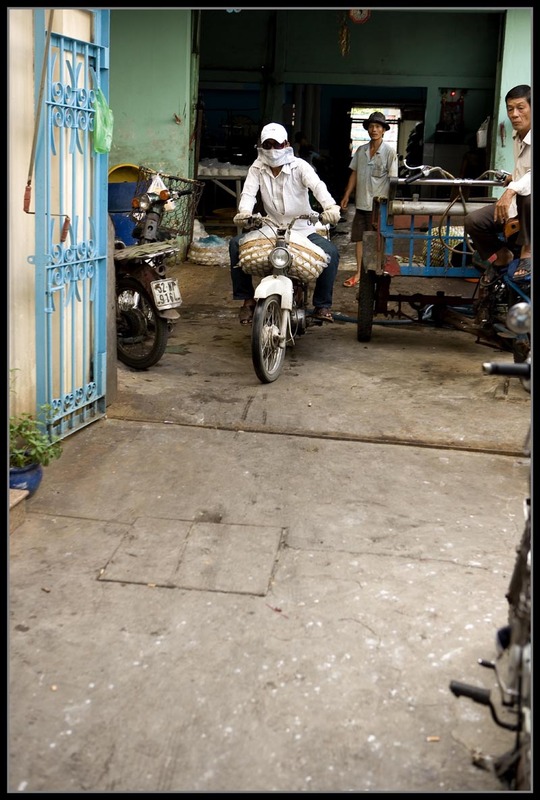 As we entered the factory one of its delivery motos was heading out, saddled with baskets of fresh bun. The owner, a taciturn but fairly talkative sort, led us to the rear room, where the first steps of turning rice into the flour from which the noodles are made occurs. The rice is first soaked overnight in water, and then mechanically ground. The rice-water is poured through a rectangular wooden sieve (above) into a big metal tub (above), and then transferred to a sort of rectangular trough. It's left overnight again, during which time the ground rice powder settles to the bottom of the trough. In the morning the water is drained off of the top (a process somewhat similar to that by which sago flour is made) and the damp rice powder is packed into huge woven bags. The bags are stacked on an ancient wooden press which, when closed, brings 1-2 tons of weight to bear upon them. Over a few hours the rice powder is relieved of its moisture. When thoroughly pressed the powder is light, chalky, and so dry it's hard to imagine that it ever contained any moisture at all. This is just like the rice flour packaged in plastic bags that you buy at the store. 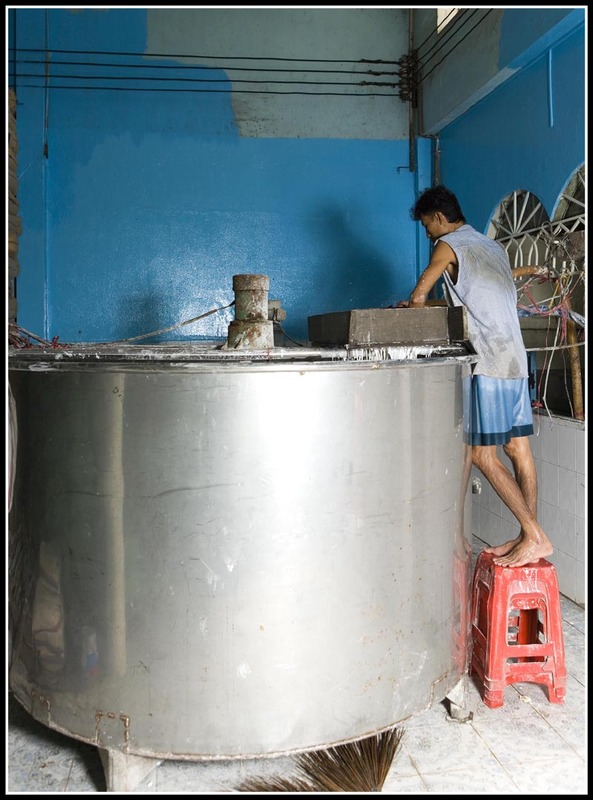 As Dave finished setting up his lights and began photographing the action in the back room, the factory owner moved us to the front, where the rice flour is mixed with hot water to a pancake batter-like consistency and poured into a sieve set over a huge pot of boiling water. As the batter strands hit the water they set firm. After a bath in cold water they're drained and gathered into bundles. The noodle bundles are left to drain further on perforated metal mats (opening photo) and then packed into plastic bags for delivery. Would we like to share more bun-making pictures with you? Definately. Unfortunately, just as the owner was showing M and I around the front room and Dave was getting ready to photograph the whole process in the rear room, the factory owner's sturdy wife strode in and pulled the plug on our tour. 'What are you doing? Are you crazy, letting these foreigners in here with their camera?' she bellowed at her husband (M translated). Apparently the Mrs. hadn't been consulted about our visit, she wasn't at all happy about it, and she wanted us out of there, fast. Dave quickly packed up his equipment and, under the glare of her evil eye, we hightailed it out of the factory. Whether she thought we were spies attempting to steal her bun secrets, whether she was nervous because of recent news stories about bun makers using optical brightener to whiten their noodles (M said it was pretty common knowledge), or whether she's just a difficult woman who enjoys embarassing her husband in front of visitors, we'll never know. But one thing was for sure - our first-hand lesson in bun making was over. Well, at least you tried. And you did get enough of the process for us to understand how it's done. Hopefully you'll meet someone who is a little more welcoming and sharing with their work than this old lady. What do you mean by "optical brighteners"? Wow, that place is so much cleaner than the bun "factory" I saw in Dalat. The one in Dalat had chickens running around in the room where they were boiling the noodles. Optical brighteners are a class of compounds used to add brightness to a product. 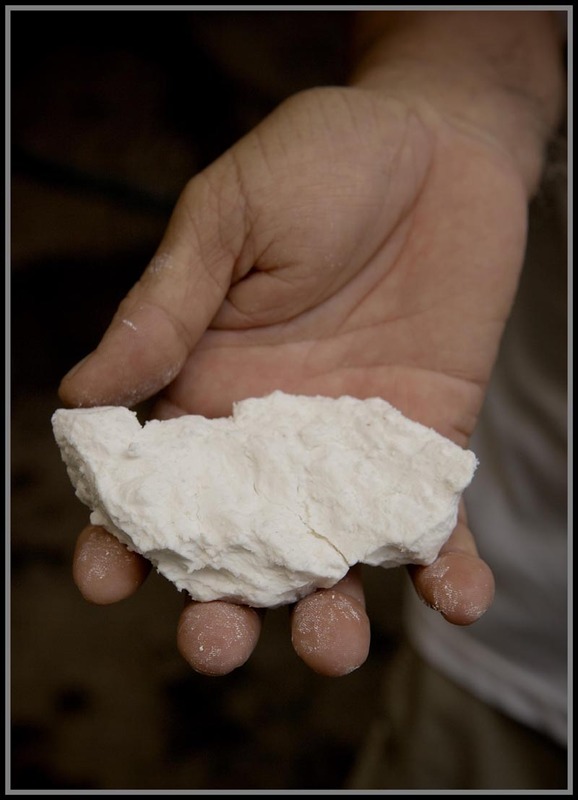 They absorb UV light and emit a visable blue light, which makes the substrate (usually textiles) appear 'whiter'. 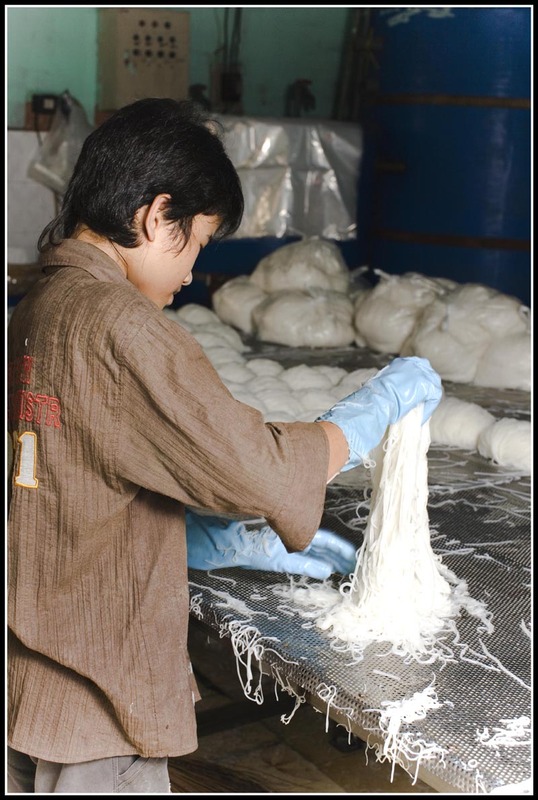 In addition to textiles optical brighteners are also used in paper, plastics, and detergents, but not food. Wow, fascinating! Too bad you couldn't get the whole story on film, but you captured the essence. hmmmmm . 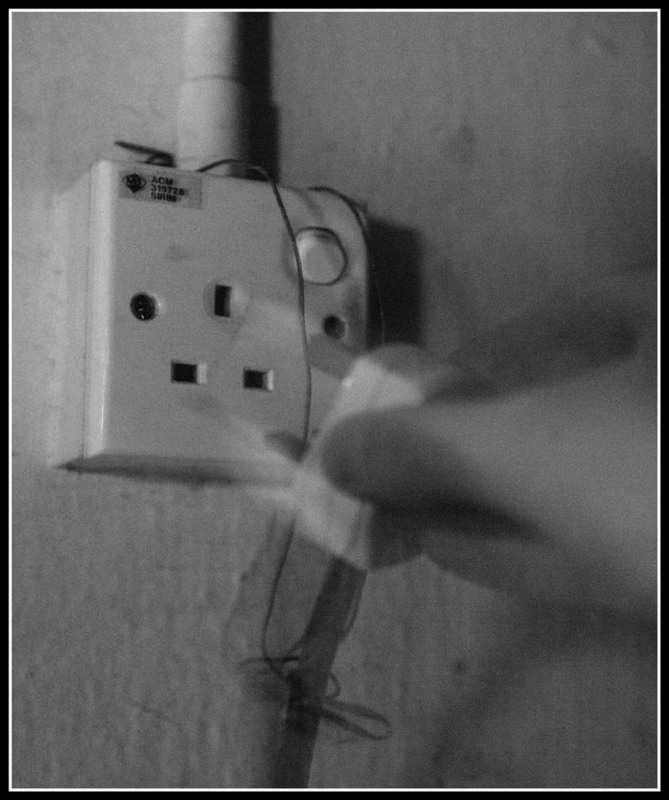 . . .all my 3.5 years there uin HCMC and never thought to ask ppl about this. Caught the idea from ya and might do that soon. COvering Vietnam Mkt in the next 6 mths. It is amazing to see how it is being done! wow! Sigh.. your pics and write-ups always make my day. Do tell me if you happen to wander south to Singapore. great post again, sorta like those old europen cheese factory of the yore. does optical brighteners make my stomach glow after consuming this stuff? i heard some horrible stuff like formaldehyde were used to keep the dried bun and pho last longer, i wonder if this is true?.